HAGIT Hero: Fr. Rosaleo Romano, CsSR. Aside from educating the younger generation about Honesty, Accountability, Good Governance, Integrity and Transparency (HAGIT), it is also our objective to give tribute to those who stood up and fought for the HAGIT principles. Dear readers, we would like to introduce our fifth HAGIT Hero, Fr. Rosaleo “Rudy” Romano. Who is Fr. Rosaleo Romano? Fr. Rosaleo “Rudy” Romano, CsSR. was born on September 26, 1940 in Manila to Gaudencio and Adelaida Romano. As a child, he was known to be popular among his classmates and was said to be exceptionally honest and hardworking in helping his parents run the family business (a dry goods store). Romano joined the Redemptorist Congregation in 1958 and was ordained a priest in 1964. Over the next decade (1967 – 1976), Fr. Rudy was immersed in missionary work in the Visayan Islands and Mindanao in the central and southern Philippines during the rise of the dictator Ferdinand Marcos (1972-1986). Coming from a sheltered childhood and the safe confines of the seminary, Fr. Rudy encountered the poorest of the poor struggling to improve their circumstances. Fr. Rudy was involved in the everyday lives of tenant farmers and subsistence agriculturalists, a group of people that comprised 75 percent of the nation’s impoverished population. In 1978, Fr. Rudy Romano attended the Ateneo Summer Institute for Pastoral Counseling under Fr. 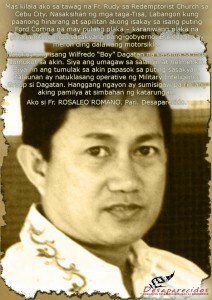 Ruben Tanseco, a Jesuit, which forever changed his life as a Filipino Redempotrist priest. On his return to the Redemptorist Center in Cebu City, he saw no distinction between his priestly vocation and being a Filipino. He worked full-time for greater social justice. In 1979 Fr. Rudy helped to found the Visayas Ecumenical Movement for Justice and Peace together with Sister Margot Lloren, OSB and Fr. Nemie Angus. As a Redemptorist priest, Fr. Rudy was the perfect follower of St. Alphonsus de Liguori, ministering to the destitute and most hapless of Christ and St. Peter’s flock. But being a product of his times, Fr. Rudy was also one of the harshest critics of Martial Law and the conjugal dictatorship then residing in Malacañang. Fr. Rudy was an activist, a staunch fighter for the poor and a leading figure in the fight against human rights abuses and the Marcos dictatorship. It is perhaps this unsettling site of a much-respected Catholic, in all his dazzling religious garments, marching in anti-Marcos rallies that have so infuriated the military and the powers-that-be. On July 11, 1985, Fr. Rudy, then 44 years old, was abducted by armed men believed to be military intelligence agents. He was never heard from or seen again. Two days after his disappearance, witnesses recounted seeing Romano on Katipunan Street in Labangon, Cebu, riding his motorcycle when he was blocked by a vehicle bearing a government license plate. The year Fr. Rudy Romano was abducted was the same year that the Marcos dictatorship desperately tried to cling to power, only to be forced in December of the same year to hold snap elections that led to the 1986 Edsa People Power revolt that drove the Marcoses out of Malacañang. Witnesses also said armed men, brandishing Armalite rifles and loudly talking in their two-way radios, have been casing the area where Fr. Rudy was last seen. Until now what really happened to Fr. Rudy and who masterminded his abduction remained unanswered questions. Fr. 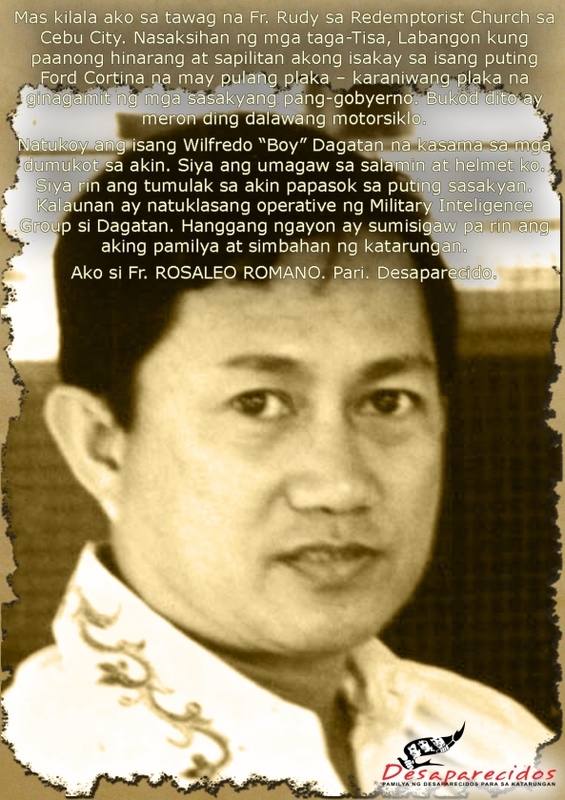 Rudy Romano was just one of hundreds of the Philippines’ desaparecidos, or victims of forced disappearance. After pursuing justice for more than 20 years, the Redemptorist Community of Cebu issued a statement in 2005 stating that they have finally accepted that they will never be able to see Fr. Rudy again. Fr. Rudy Romano remains present in the hearts of the Cebuanos. The marker which the local government of Cebu established in his honor in the very place where he was abducted is a constant reminder of Fr. Romano’s unflinching commitment to the cause of the downtrodden. More importantly, his exemplary deeds which touched the lives of many will never ever be forgotten. Fr. Rudy Romano is ever present in our hearts.